1Combine 1 gallon of water, bay leaves, lemons, parsley, thyme, rosemary, sage, garlic, salt, honey and peppercorns in a 3-gallon stockpot. Bring to a boil and boil for 1 minute stirring. Remove the brine from the heat. 2Add 2 gallons of ice water to the hot brine. Close the drain in your kitchen sink, place the stockpot with the brine in the sink and pour the ice into the sink around the stockpot. Fill the sink with cold water. Let the brine continue to cool down stirring it occasionally. 3Place the turkey in a clean bucket and pour enough of the cooled brine over the turkey to cover it. Place a heavy plate on top to keep it submerged in the brining liquid. Refrigerate the turkey in the brine for 24 hours. 1Combine woodchips in large bowl and cover with 4 cups of water. Allow woodchips to soak while prepping the turkey and setting up the grill (at least 30 minutes). 1Remove the turkey from the brine and discard the brine. Pat the turkey dry with paper towels. Using a kitchen brush, apply the oil to the outside of the turkey. Sprinkle inside the cavity and outside of the turkey with the Up Yours Chicken Rub. Rub the seasoning onto the outside of the turkey so the flavors can penetrate the turkey. 2Cut a 4-foot length of butcher’s twine. Tuck the wing tips under turkey. With the legs facing away, center the twine under legs of turkey. Wrap the twine around the legs, crisscrossing the ends, then pull the twine tightly to secure the legs. Run the twine the length of the turkey, securing the wing tips. Tie the ends of twine together over the neck skin and cut off any excess twine. 3Place the seasoned, trussed turkey into a large, aluminum foil roasting pan. Form the butter into a ball; gently press the butter onto the outside of the turkey in the center of the turkey breast. Tightly cover the pan with 2 sheets of aluminum foil and then use scissors to cut a 2-inch wide hole in the foil above the butter and slightly open the hole with your fingers to create a vent. 1Remove the top grill grate from the charcoal grill. Place coals in a chimney starter. Spark the coals and let the coals burn until they are covered with a thick layer of gray ash. Spread the coals on one side of the bottom grate. 2Drain the woodchips and place about 3 cups on the hot coals. Close the grill and open the vent, also known as the damper, on the lid. The damper helps to control the heat: opening the vent creates more heat, while a slightly opened or closed vent helps reduce or maintain the heat. 3Once the woodchips start smoking, remove the lid. Add about 1 cup woodchips over the hot coals. Place an aluminum foil loaf pan on the bottom rack opposite the hot coals. Add 4 cups of water to the pan. If the grill does not have a built-in thermometer, attach an oven thermometer to the top grill grate, replace the top grate and close the grill. 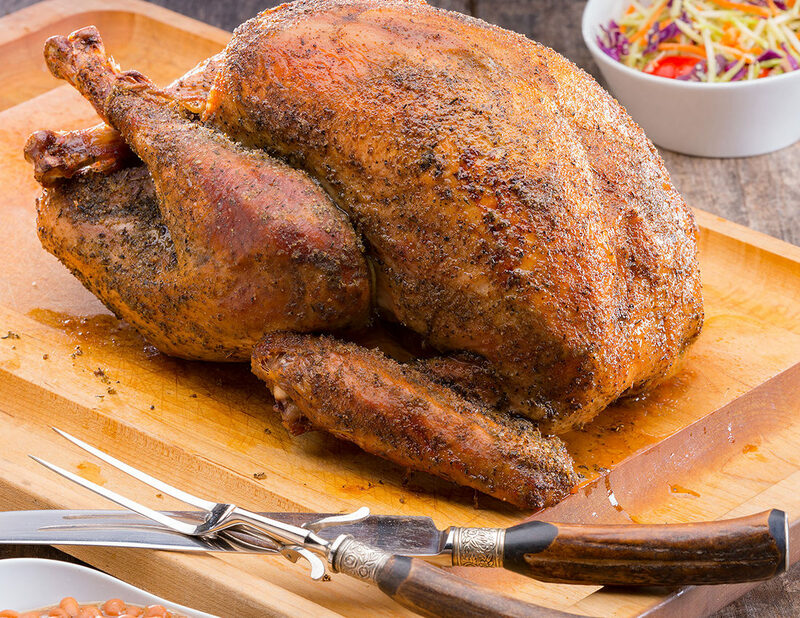 1Once the temperature of the smoking chamber reaches 250° to 300°F, place the aluminum roasting pan with the turkey on the top grill grate over the pan of water. Cover the grill and smoke the turkey 5 to 6 hours. To maintain the temperature of the grill between 250° and 300°F, carefully add additional coals periodically through the opening at one side of the top grill grate or in between rungs of the top grill grate. In the same fashion, periodically add woodchips onto the hot coals as smoking decreases. 2Smoke the turkey until juices run clear and an instant-read meat thermometer inserted into the thickest part of the thigh reaches 160°F. Use the oven mitts to remove the turkey from the gill and let stand 20 minutes before carving. Add a flavorful liquid, such as apple juice, to the aluminum foil loaf pan along with the water. Use a ratio of 2 cups water to 2 cups flavored liquid. Trussing the turkey is an important preparation step for any whole poultry. It may take a few attempts to get it right, but it is a must have kitchen trick for ensuring all parts of the bird moist.